Exporter of a wide range of products which include flexible braids. We offer a wide choice of braid types, strand sizes, finishes, termination options and insulation.We use the finest quality materials to ensure consistent quality and performance. Copper braid is made from weaving together strands of copper wire. 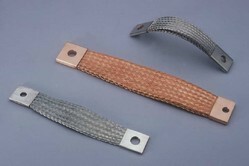 The flexibility of the braid is determined by the diameter of the copper wire. The smaller the wire the greater the flexibility and the larger the volume occupied by the braid and the more expensive the braid becomes.Our flexible flat copper braids are used as earthing straps and in numerous electrical components.We supply high current copper braid connectors for busbar to transformer connections and any other electrical connections within a power transmission system. Looking for Flexible Braids ?